And with that little wind, the sea was almost mirror-calm with little cat’s paws raking the surface every now and then and a gentle swell of 0 to 2 feet most of the way. During the night we passed two sailboats heading in our direction, giving me practice at identifying targets on the radar at night and verifying what running lights on a sailboat’s spreaders look like. The radio was quiet. The icing on the cake was a sighting of humpback whales just after sunrise, a mother and calf feeding not 100 yards off our starboard side. 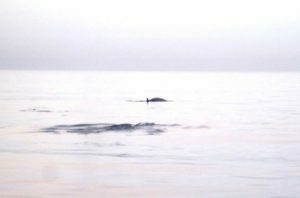 When they sounded, I ran for the camera and hoped they would appear again for a picture…and as luck would have it, they surfaced and blew about 50 yards off the port side. I could get used to that – but probably shouldn’t. We made better speed than we anticipated, and arrived abeam of Mazatlan’s harbor by 8:30. It was just another 45 minutes to the entrance to El Cid Marina and the protection of Marina Mazatlan. And when we got there, the “welcoming committee” was ready: Chris, Gerry, and Goof standing at the end of the dock waiting to catch our lines. Ole had wondered whether Goof would remember him, and as we slid up the channel toward the dock to within about 200 yards, I could hear Goof whining and see her dancing – she absolutely recognized the sound of our engines and the look of our boat. As we were securing the lines, she was beside herself to leap on the boat and run circles around Ole, whining, singing and dancing. What a great dog! Marian at the Fonatur Marina is a doll, and made our check-in delightful. A nice walk over to Marina Mazatlan for a look-see and a hot breakfast prepped us nicely for our arrival nap. And at Gerry and Chris’s suggestion, dinner at the Fat Fish on Mazatlan’s Gold Coast was fabulous – barbecued pork ribs with what tasted like my mom’s favorite orange sparerib sauce. All in all, a very very good day! We’re scheduled to go out of the water on Tuesday afternoon, as the yard doesn’t work on Sundays and Monday is a national holiday.